Homer builds, and then tweaks. Our rolling egg layer pens have kept our hens in strong production this winter, and he made them easy to move and strong. 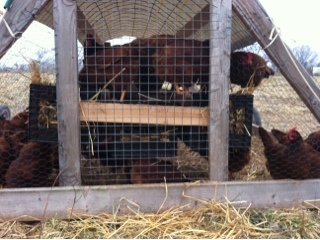 Last summer we started a flock of Rhode Island Reds hens. They came to the farm as day old peepers, and now are old enough to begin laying eggs. The rest of our hens have nest boxes hanging outside of the pen, with an extra bit of roof over them. We flip up the roof and gather the eggs. Gravity closes the roof, it would take effort to leave it open. This pen has a door made of wire mesh. It has to be opened and closed. I'm already nervous about this pen, and have terrible visions of the door left slightly ajar, the hens working their way out...and all the predators swooping, running, pouncing, slithering, pawing in and getting these girls. Farm living. Trying to stay 2 steps ahead of chicken lovers.